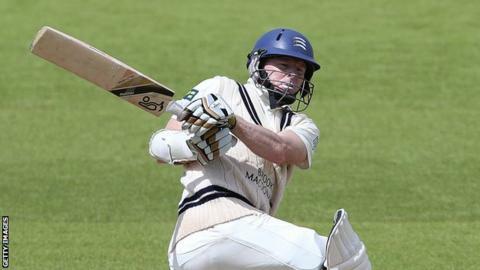 Middlesex captain Chris Rogers says his side's middle order must improve their batting after a second-innings collapse in the defeat at Warwickshire. The Lord's side lost their last eight wickets for just 93 runs as they lost by an innings and 37 runs on Tuesday. "It's frustrating as much for those guys as much as anyone else," the 36-year-old told BBC London 94.9. "They're trying so hard but it's just not quite happening. That's the way it went and we've got to fix it really." The Australian added: "You give them a rocket and that may not be the best thing to do. "Everyone is trying, there's no doubt they're trying as hard as they can but the results aren't going their way. "You've got to hang in there. We're a team and hopefully we'll turn this around." Middlesex scored 167 in their first innings, with only four players reaching double figures before Warwickshire posted 462 in reply. Having lost nightwatchman James Harris early on day three, Rogers and England Lions prospect Sam Robson put on a partnership of 149 for the second wicket. After those two departed within quick succession Middlesex put up little resistance and suffered their second defeat of the season. The London side have only picked up four batting bonus points from their four games in 2014. "You play good opposition regularly when you are a first-class cricketer and you have got to get better," added Rogers. "At the moment the question is are they getting better? We all need a turnaround and there is not much else to say. "While they are under pressure I hope they take these challenges on and try to perform and make themselves better cricketers."